My latest stop. Learn more about me and Granny. Thank you Theresa for having me. 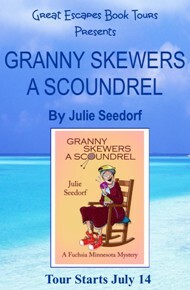 Today we are being visited by Julie Seedorf on her book tour for her latest book, Granny Skewers a Scoundrel. I had the chance to interview Julie and one of the most interesting things I found about her is that she also has a young readers series! Previous Reviewer Wants Granny To Adopt Her.